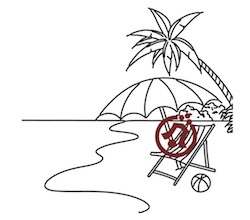 Please note: due to the summer holidays and the closing of the HKU Nederlandse Beiaardschool, where our office is also located, there will likely be a delay in reply to your order or email. We have received your request and will process it soon. After the 3rd of September, we will be at your full disposal again. I wish you all a fine summer! 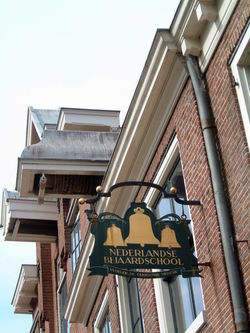 On Tuesday, the 19th of June, several students of the HKU Nederlandse Beiaardschool performed their final or qualifying examination concerts on the Eijsbout-carillon at the Tower of Our Lady in Amersfoort. 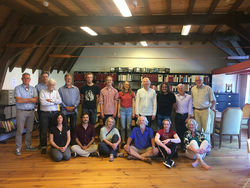 As part of the centenary of the Dutch Carillon Association (Nederlandse Klokkenspel-Vereniging founded in 1918), composer and lecturer Peter-Jan Wagemans held a masterclass in the Carillon School on the 29th of June. 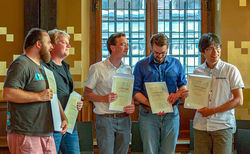 On Monday, July 2, in the Michaels Chapel in the Utrecht Dom Tower, a collection of carillon music by Jacob van Eyck for carillonneurs and campanologists was presented. 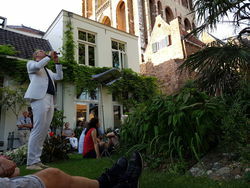 That portentous event was preceded by this year’s first summer evening concert organised by the ninety-year-old Utrecht Bell Ringing Association (UKV). 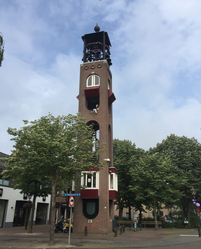 The centenary of the Dutch Carillon Association (Nederlandse Klokkenspel-Vereniging founded in 1918), provided an ideal opportunity to organise an International Carillon Contest played on the carillon of the Peperbus in Zwolle and de Nieuwe Toren in Kampen. 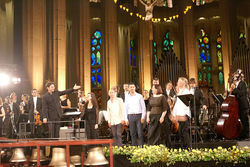 Last year, the nineteenth Congress of the World Carillon Federation took place in Barcelona in the first week of July. The city itself has one carillon situated on top of the Palau de Generalitat, the seat of the Catalan government. The bells hang in an open structure inspired by the crown of one of the towers of the adjacent cathedral. The listening venue inside the palace is very delightful. Children of groups 5 and 6 of elementary schools from Bunschoten and Spakenburg visited the Beiaardschool in Amersfoort in May and June this year. Their visit was arranged as part of the cultural program called “het Carillon project” organised by Kunst Centraal.